bits | Are We There Yet? I used to be a saver. Ok, I still save some things. I have buried deep in the basement letters from my tween years through my courting days with my husband. And some stuff I inherited from now deceased relatives which was already neatly packed in their house and I just moved it into mine intact. But since having kids, I am constantly trying to throw things out. Sometimes I have to be sneaky about it. Recently, I stumbled upon my old business cards. Now these would have moved here in their box from the office desk to the moving box to the home desk drawer without thinking. Yesterday, while in a lather looking for tax documents, I found them and immediately pitched them. I didn’t really even think twice about it. I did note that I was glad it didn’t bother me to toss them and did think that I could save them for my kids to play with, but I knew if I saved them, I would find them all over the house used in any wide range of new ways. Today, Russ put them in the recycling bin as a part of our regular Saturday “trash roundup”. Now my children love to save and create stuff. It really starts in preschool where they make any wide range of “recycling art” and it comes home for Mama to admire their trash creations of the day. In elementary school it continues. The kindergarten teacher requests parents to bring in small recycling objects. My youngest, Katie, is so well behaved that while each child has only one official day at the “creation station” she gets to go almost every day. The result of course is that I am greeted by someone’s trash repurposed as art at least three days a week. Situation #1: “Mom, I “gave” you that! You can’t throw it away!” Ah yes, so what am I to do with this “parking garage” constructed of someone’s d’animals yogurt container (not recyclable, btw), a coffee filter (clean), a toothpaste box (mine that I had donated now returned to me), and random small pieces of string. So, I save it. I display it for as long as I can tolerate. About four days. Then it disappears. Situation #2: “Mom, I’m still using that!” The “creations” that are not gifted are co-opted into play. 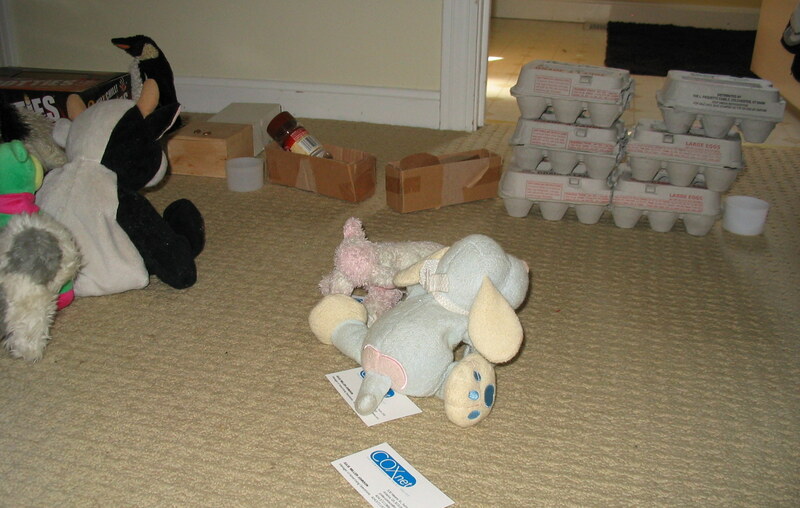 So, the d’animals container (YUCK, btw) taped to a cereal box with mini-champagne flutes (like from a party favor) become part of a game with stuffed animals. Now, the trash project, is in my family room with the animals, the blocks and the car garage (made of recyled boxes). Or the bedroom walls are decorated with their “art”. Today my children have been playing so nicely together. I love it when they are in that good groove where they play imaginative games. They started with matchbox cars before I awoke and then took it outside and then came back in with a handful of recycling from the bins in the garage. What did they come in with? My business cards! They are now being used as “credit cards” for their game of shopping. Strewn across the breakfast bar is all the cardboard contents of my recycling bin, tape, scissors, and my business cards. The really great news is that I no longer have any emotional attachment to those cards, so at least I don’t have an emotional response to them. It’s all the same clutter to me. I haven’t been up in their bedrooms yet, but I can almost guarantee you there are at least 2 cartons of eggs in at least 4 pieces. The business cards might be up there too. I think I’ll go check!